Scottish Country Dance is ballroom dancing, not folk dancing. 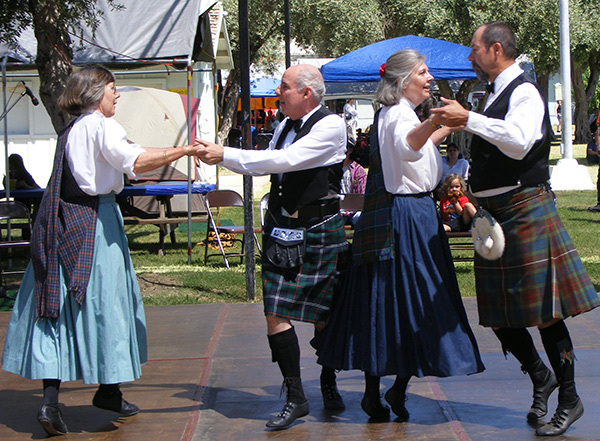 Unlike traditional American ballroom dancing, Scottish Country dances are done in groups (sets) of four couples positioned in parallel lines, with partners facing each other. Each dance is made up of different “figures,” such as down the middle and back. Simple dances might have four figures; complex dances may have as many as 16. The music can be slow or fast. It’s a lot of fun, and great exercise also. Area 1.